Summary: Who could have pushed Shelby Poinsett out her second-floor library window besides her husband? 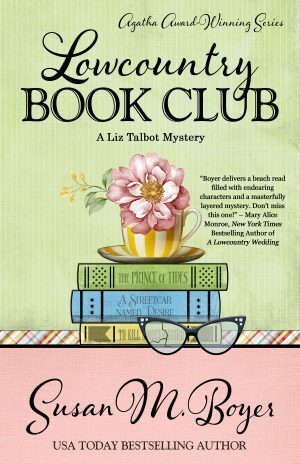 In USA Today bestselling and Agatha Award-winning author Susan M. Boyer’s new novel Lowcountry Book Club, Private Investigator Liz Talbot enters a tight-knit community of Charleston, SC’s genteel women who have gossip to spill, secrets of their own, and a hundred-year-old book club they are dying to join. The cover. Henery Press does great covers- and this is no exception. The setting. I’ve never been to the area that Susan writes about- and yet her writing is so descriptive- I can “see” the area. The characters. I’m Southern. I appreciate a good story where the author shows Southern ways of life in a true fashion and not to make us look like hicks. Susan nailed this perfectly. Her mama’s Sunday suppers- I’ve been to those kind of suppers. The appreciation of fried chicken? I have MUCH appreciation for fried chicken and have gasped in horror when people pass on it. Liz. I like a strong character. A woman with a take charge attitude that also knows how to use her Southern charms. Give me more! Nate. There are men and their are boys. Nate is a man. Enough said. Im guilty of choosing books by their covers. Had i seen this one, i know i woulda picked it up. Thanks for the review, dear.